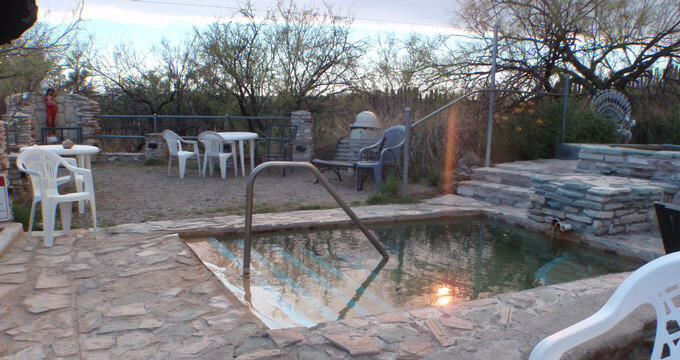 Situated 25 miles from the nearest community, Faywood Hot Springs Resort is a true oasis in the New Mexican desert. Throughout history the area’s mineral hot springs provided rest and healing to weary travelers. Today guests at Faywood can soak in one of the resort’s 15 public and private pools and hot tubs, surrounded by a high-desert landscape. 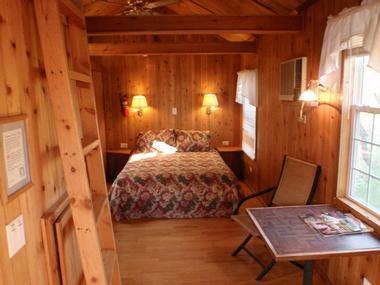 Guests can stay in one of the resort’s rustic cabins or bring their RV or tent to stay on the resort’s campgrounds. Facilities at Faywood Hot Springs Resort are separated into clothing-required and clothing-optional areas to welcome members of the naturist and nudist communities. An on-site clubhouse offers a large fireplace, bathrooms, and a kitchenette, while the resort’s visitor’s center includes a store and gift shop. Faywood Hot Springs Resort offers a mix of clothing-required and clothing-optional accommodations for natural and nudist communities. The campground has 11 campsites each with a fire ring, water spigot, and picnic table with outhouses located throughout the campground. Guests may enjoy free access to showers and bathrooms in the bath house. Campers can also use the fire pits and hot spring mineral pools. Each of which has a clothing-required or clothing-optional area. Guests at the clothing-optional campground have access to many of the same on-site amenities, with space for tents and RVs, but are required to wear clothing when leaving the campground. The Gatehouse Casita, located within the clothing-optional campground, is a climate-controlled cabin with full size hide-a-bed, table and chairs, electrical outlet and access to nearby outhouse and hose bib. The resort also offers six one-bedroom lofted cabins, with occupancy ranging from two to four adults (or two adults and three children), and one historic adobe casita for two. Some cabins are pet-friendly, with one cabin configured to accommodate guests with disabilities. A total of 15 mineral soaking pools and hot tubs are spread throughout the Faywood Hot Springs Resort. Each outdoor pool is temperature controlled and secluded in a private outdoor area. The resort’s clothing-required and clothing-optional areas each house their own three public soaking pools kept at temperatures ranging from cool to hot. Guests at Faywood can pay an additional fee to reserve time in the resort’s private pools and hot tubs. Overnight guests at the resort may use the clothing-optional bath house, with three pools ranging from cool to hot and an indoor family-size shower. The group pool can hold up to 25 guests in a private, fenced in area, and is appropriate for large families and wedding parties. On summer nights, resort staff remove the shades covering many of the pools for evening star gazing from the water. Guests with disabilities can easily access most of the resort’s public pools, as well as two private pools and one private hot tub. The town of Deming, about 25 miles South of Faywood Hot Springs, offers a few dining options for lunch, dinner, and drinks. Forghedaboudit Pizza serves Italian pizzas and sandwiches, while options for Mexican fare include Irma’s Mexican Restaurant, Sunrise Kitchen and Tacos Marisol. The St. Clair Winery and Tasting Room offers New Mexican wines by the glass or the bottle to take home. Silver City lies 25 miles North of the resort, with restaurants and several places to grab a coffee or alcoholic beverage. Shevek & Co Restaurant offers a fine dining experience with brunch, lunch, and dinner menus, while Vicki’s Eatery serves hearty breakfasts, healthy lunches, and classic American dinners. Little Toad Creek Brewery & Distillery specializes in small-batch craft beer and spirits, and serves pub fare, flatbreads, salads, burgers, and sandwiches with specialty desserts. Guests can head to the Silver City Co-op to stock up on health and bulk foods and personal care items, or Bear Creek Herbs for tea, tinctures, and loose herbs. Javalina Coffee House serves coffee and espresso, with Wi-Fi available. Within a 1-mile hike of the resort lies City of Rocks State Park, with thousands of unique volcanic rock formations littering the park. Hiking and mountain biking trails wind through the park, with camping, birding, wildlife viewing and picnicking opportunities also available. 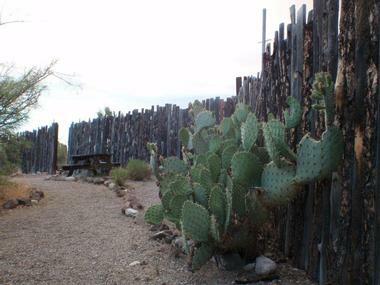 Similar activities can be found at Rockhound State Park in Deming, situated on the wildflower-covered foothills of the Little Florida Mountains. While in Deming visitors can stop at Black Hat Trading for semi-precious stones and beads, view the work of regional artists at the Deming Arts Center, or browse a collection of historical artifacts at the Deming Luna Mimbres Museum. Visitors to Silver City can shop at Guadalupe’s for globally-sourced spiritual gifts and books or The Pink Store for a variety of trinkets and treasures. The Gila Cliff Dwellings at nearby Gila National Forest are a must-see, built by the Mogollan people in the 1200s in the caves of the Gila River.